Original catalog numbers: GSW 301/2 (LP), D50Y3155 (CD), only released in Japan. 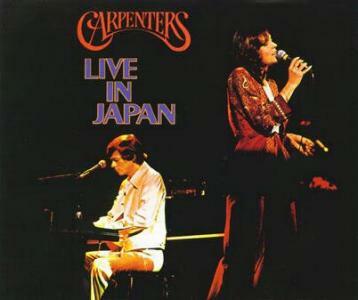 On a noteworthy stop in Osaka, Japan as part of their world tour, the Carpenters recorded and released the LIVE IN JAPAN album. Issued in Japan as a 2-record set (GSW-301/2) and never in the US, it would be one of two live efforts to be officially released. Very representative of their 1974 concert sound, the album contains a good selection of songs that were favored by live audiences of the day. In addition to the hits, there are some of the lesser-known songs like “Mr. Guder” and “Jambalaya (On The Bayou)” thrown into the mix. Prominently featured on this set is the expanded live version of the “Oldies Medley,” complete with DJ Tony Peluso and a vocal assist from Pete Henderson, half of the comedy team of Skiles & Henderson who were touring with the Carpenters and providing the warm-up act. The touring band was comprised of: Cubby O’Brien (the former original Mouseketeer) on drums; Bob Messenger on electric bass, flute, tenor sax and backing vocals; Tony Peluso on guitar, organ, electric bass, and arp synthesizer; and Doug Strawn on electric clarinet, organ and backing vocals. As they would do just about everywhere they went in concert, for the backing on “Sing” the Carpenters would bring out a local children’s chorus – the Kyoto Children’s Choir in this case. The concert was long enough to have required two LPs, but short enough to have fit on one CD. Still, when reissued on CD (D50Y3155), it remained a two-disc set, boosting the price. Curiously on both the LP and CD, the opening minute of the concert features some feedback and warm-up noises before the announcer actually introduces the group.